Date of release of VRO jobs? Time table for recruitment for VRO job? Information regarding VRO jobs? What is the age limit for VRO job for OC candidates? Date of release of notification for VRO jobs in AP? Can I expect VRO job in Guntur District? Re: Last date for VRO jobs? How to move for the job? Last date for the VRO job is 17 December 2011. you can apply online from 26 november to 17 dec.
interview schedule 18 DEC to 28 JAN 2012. So proceed according to the above details and apply online. Last date for receipt of applications is 29Th-December-2011. 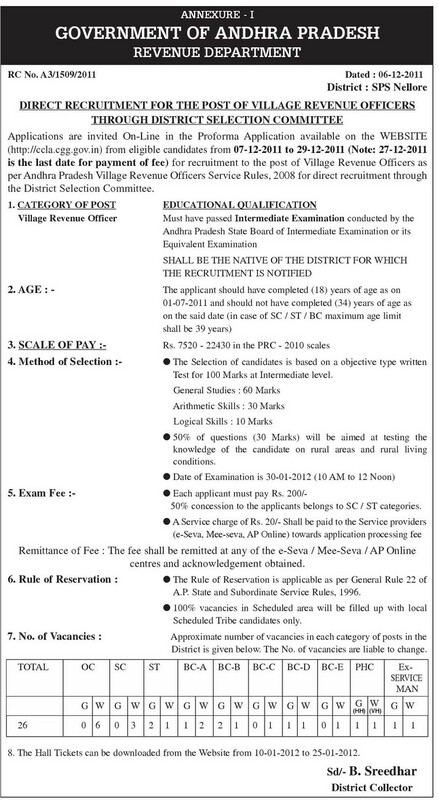 V.R.O is Village Revenue Officers,We have total 1,172 Posts available in Andhra Pradesh. If you want to apply for these posts,You should obtained Intermediate from recognized Board. We have no Interview for these posts,We have Written Exam for these posts,You should attend Written Exam if you are shortlisted by recruitment department. Age limits are mentioned for this exam in Notification,So first we have to wait for notification. Completion of recruitment and posting: 31st January 2012. *** The candidates should have completed intermediate from recognised university or board. *** The age of the candidates should be between 18-25 year. The sale of application form for VRO jobs is starting from 26th November, 2011 and the last date for submission of filled application form is 17th December,2011. Selection will be done through the examination of Written test which contains general knowledge questions. Still the syllabus for exam is not yet declared you may need to check the website frequently. Read books on Indian Geography, Aptitude problems, Current affairs and Indian polity. - The awaiting notification for VRO and VRA exam has been published by revenue department of Andhra Government on 07.12.2011. - The exam is fixed on 30.01.2012. - Candidates have to download Admit Cards for Exam between 10.01.2012 and 25.1.2012. - Tentitative date for decelaration of result is 15.02.2012. Eligible candidates have to pay Rs. 200/- as exam fees for VRO & VRA post. For SC/ST categories there will be 50% of concession on examination fees. The fees have to be remitted at any of the E-Seva/ Mee-Seva/ AP online centers and have to get acknowledgement. You will be charged Rs.20/- as service charge for service providers of E-Seva, Mee-Seva, AP-Online towards application processing fees. AP VRO 2012 exam date and timings: 30.01.2012 from 10 am to 12 noon. AP VRA 2012 exam date and timings: 30.01.2012 from 3 pm to 5 pm. Date for downloading hall tickets for VRO & VRA exam: 10.01.2012 to 25.01.2012. 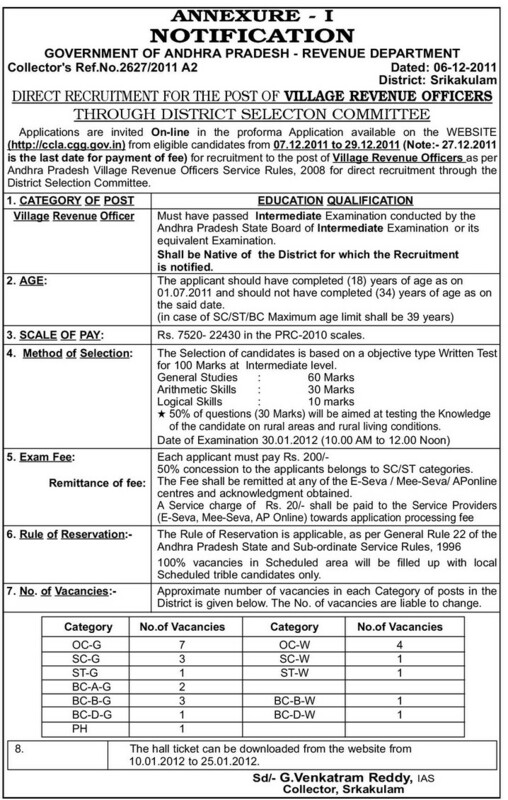 Sir,Last date for receipt of applications is 29Th-December-2011.V.R.O is Village Revenue Officers,We have total 1,172 Posts available in Andhra Pradesh.If you want to apply for these posts,You should obtained Intermediate from recognized Board. you can fill the application through online or through e-seva office, the last date of filling the application as been extended to 18.1.2012,the payment last date for fee is 17.1.2012..candidates can get the entire information at official website http://ccla.cgg.gov.in/..
the minimum educational qualification is candidates must complete intermediate or equivalent from the recognized college or university..
the age limit is must be from 18 to 34 years, relaxation for reserved candidates.